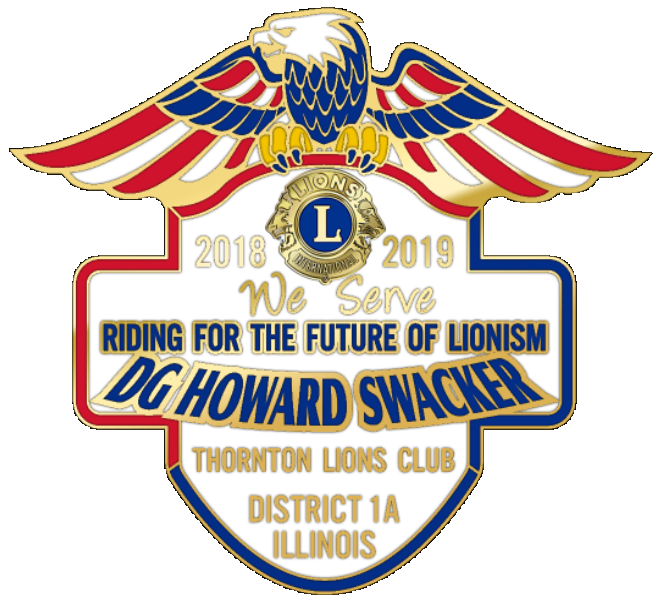 "RIDING INTO THE FUTURE WITH LIONS"
Lion Howard joined the Glenwood Lions Club in February 1999. During that time, he and the Glenwood Lions Club were instrumental in various charitable functions, and most notably, the Annual Glenwood Lions Rib Fest. As a man of action he quickly became club president from 2002-2004, He always gave any spare time to his club and community and eventually became Zone Chairperson from 2008-2012. Howard transferred to the Thornton Lions Club in 2011. From 2012-2016, he rose to the ranks of Region Chairperson and served as Thornton Lions Club Second Vice President from 2014-2016. In 2016, Howard was Thornton’s Club President and Region Chairperson. Howard became Second Vice District Governor in 2016, First Vice District Governor in 2017, and District 1-A Governor in 2018. Howard received the 2-Member Key in May 2001, Club President Excellence Award in June 2004, Lion of the Year 2007-2009, Lion of the year 2012,recived a 15 Year Monarch Chevron in February 2014, and the esteemed Melvin Jones Fellowship Award in November 2017. Within the span of 1979-2013 working for Chicago Heights Glass Inc., he started sweeping floors and worked his way to a glazier journeyman. During the course of his employment with the company he fully restored not one but two 1960’s corvettes, installed all of the glass in Oakbrook Terrace Tower (and several other popular Chicago landmark skyscrapers), received every safety award given from the conglomerates from each site, and annoyed every superintendent at every site. After his renegade, get the job done right, and above all else take no bull run, Howard retired in June 2013 as Glazing Superintendent. He is still a proud union member. Howard has been married to his high school sweet heart, Karen since 1974. They have two children, Howard and Anna. Howard has been a member of the Zoning board in Glenwood for the past 12 years and past member of the Police and Fire pension board in Glenwood IL.